Nestled among manicured lawns in St. Michaels, Maryland is The Inn at Perry Cabin Belmond, a magnificent resort and spa which offers heritage charm beside the Miles River. At The Inn at Perry Cabin one can step into the rhythm of coastal living, swim beneath the sunny skies, dine on the freshest catch and take the wheel and sail the waters of the Chesapeake Bay. (Source). Pictured preassembled at Thermo-Kool’s factory is an actual size 31’8” x 8’8” x 8’2” high Thermo-Kool walk-in cooler/freezer combination which was recently installed at the The Inn at Perry Cabin Belmond. Thermo-Kool’s uncompromising commitment to the highest level of quality and excellent customer service make a perfect fit for the elegant resort venue. 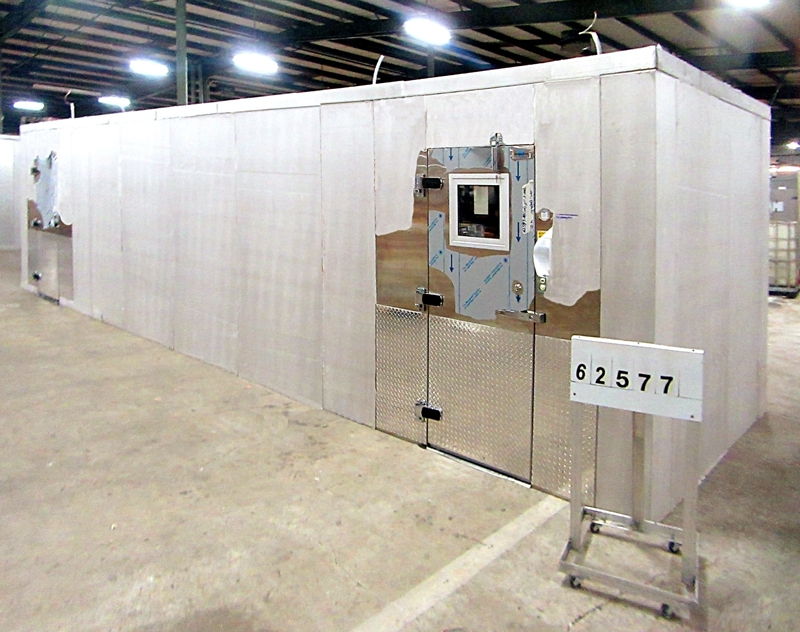 Thermo-Kool’s high density DURATHANE panel perimeter allowed the Thermo-Kool walk-in to be preassembled prior to shipment for a thorough quality control inspection to avoid “hidden costs” at the time of installation. With Thermo-Kool’s ability to manufacture in 1” panel increments the walk-in was manufactured in the exact size needed to maximize storage space capabilities with no “cutting and pasting” required in the field! The white stucco galvanized interior ceiling of the walk-in cooler/freezer along with LED light fixtures ensure maximum illumination is provided. The walk-in freezer compartment is designed with Thermo-Kool’s DURA–Floor heavy duty structural support floor to give additional strength of up to 12,000 lb stationary load per square foot to the floor. A NSF approved foamed-in-place interior ramp was provided as an integral part of the floor design. The doors were equipped with deadbolt locks, adjustable hinges and, 36” high 1/8” aluminum treadplate kickplates and jamb guards on the interior and exterior to protect the doors against excessive abuse and traffic. In addition to the 1/8” aluminum treadplate on the doors, 36” high 1/8” aluminum treadplate wainscot was provided for the exposed exterior. Thermo-Kool Customer Account Representative, Debbi Tisdale, worked on the project with Thermo-Kool Marketing Agents, SpecSource Marketing, LLC, Ellicott City, Maryland.